New Delhi: Expressing his concern over the unprecedented scale of environmental degradation and its drastic consequences, the Vice President of India, Shri M. Venkaiah Naidu called upon all nations to collaborate and cooperate in an equally unparalleled manner to ensure sustainable development. The Vice President quoted the ancient Indian adage – “Dharmo Rakshati Rakshitah”. If you promote righteousness, it will protect you and if you protect the nature, it will protect you and nourish, if we don’t, we run the risk of perishing, he added. Shri Naidu further said that the earth is our mother and humanity should collectively rise above our trivial differences of race, religion, and power, and act in unison to save her. 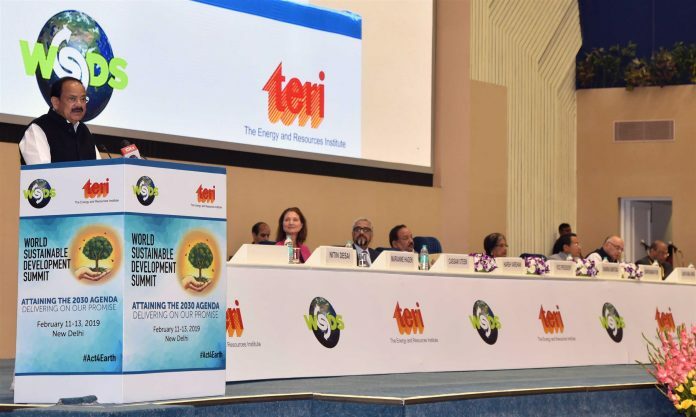 The Vice President said that India is amongst the few countries of the world where forests are growing in spite of exponentially rising population and livestock pressures and India’s forests act as a net carbon sink. India has set a target of raising its existing 21.54% forest cover to 33% of the total geographical area through aggressive forestation drives, he added. I am happy to note that over the past 18 years, the World Sustainable Development Summit has emerged as a credible institution, a powerful meeting point of the world’s leading experts on sustainable development. India’s forests act as a net carbon sink. India has set a target of raising its existing 21.54% forest cover to 33% of the total geographical area through aggressive forestation drives. The Unnat Jyoti by Affordable LEDs for All (UJALA), the world’s largest domestic lighting scheme has successfully mitigated over Rs. 16,000 Crore in energy costs, while avoiding emissions of 3.4 Crore tons of CO2 .